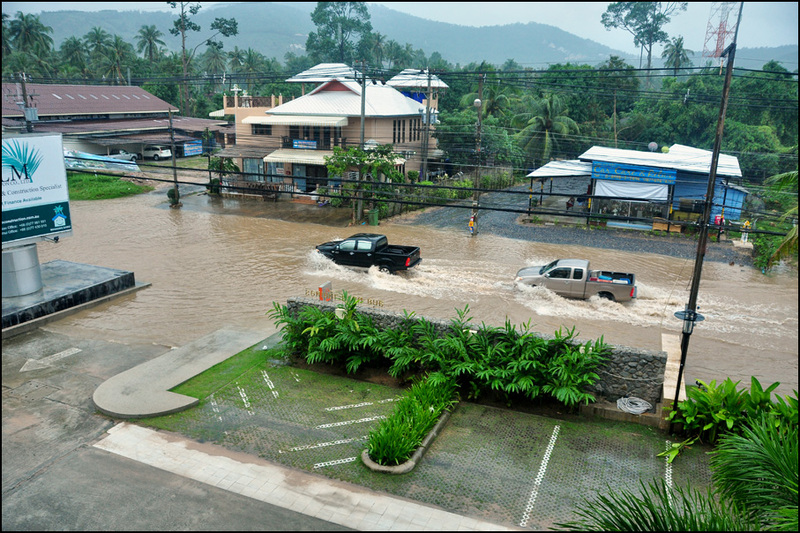 Hubby took this picture 5 minutes ago ( at 3.15 pm) from our usual viewpoint - our balcony - we don't really want to leave the house right now as we may not be able to get back if it continues like that... Hardly managed to get baby from nursery as Bophut is flooded again, so I wouldn't advise going there right now. Will keep you posted, guys. I was hopeful when i saw your last lovely pictures and just booked the Zara Beach resort on Lamai for the end of this month. Guess i better cancel the taxi and get a boat to pick us up instead.. Thanks for posting, and fingers crossed for you guys. hope you guys are well, elina. James, don't worry, according to forecasts it will only get better from tomorrow, with only occasional rain... I think you will be absolutely fine. Elina, you need anything from Europe ? I'm flying in tomorrow.. gosh... like James, cancel the taxi, send a boat or a speed boat..
Good I found your blog, great stuff! Dont know where your roots are but your name sounds very Finnish/Swedish! Really great blog. My young family and I are arriving on the 20th Nov, so I guess we can expect rain! Any tips for rainy day play for 3 + 1 year olds? Also when do the local weather forecasts predict a change for the better. Eeepo - I am Russian/British. Adam - take them to Tesco Lotus or Big C to kids playground, they will like it. Thats where we spend our rainy day with our 20 months old son. I'm in London next week, so was just a thought.